This Thai Shrimp Salad Recipe was something I literally came up with and executed in about 20-25 minutes. I had just experimented with a Shrimp Spring Roll Recipe the day before which was FANTASTIC (recipe coming soon), and I just could not stop craving the flavors. Plus, I had some leftover ingredients on hand. So, I tossed together the salad, softened the saifun bean thread noodles, and whisked up the dressing. It was absolutely delicious and very filling for just 5 Points. The saifun bean threads really help add some bulk to the salad without adding a lot of extra Points. 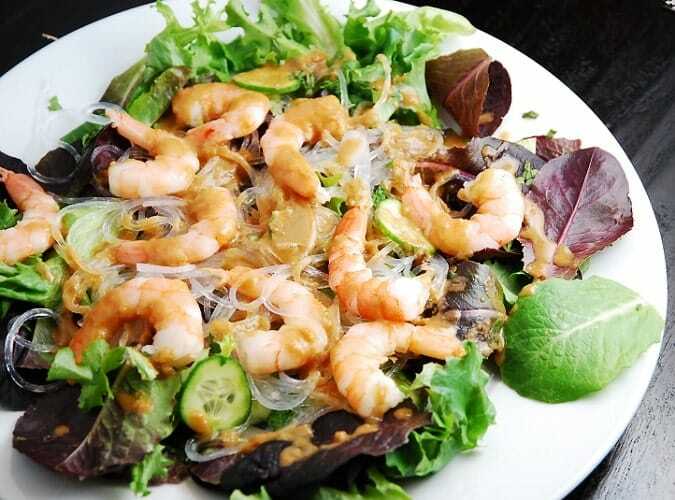 The shrimp and peanut lime dressing provide the protein. It was one very satisfying salad. Next time I make it though, I’ll add more vegetables…like some small sweet red peppers and sugar snap peas. I was just in such a hurry to eat, I didn’t take the time to get too creative and add a lot of color like I usually try to do. I just needed that salad in my belly…ASAP! And don’t be intimidated by the “saifun bean threads”…they are just cellophane noodles or “glass noodles”…you should be able to find them in the Asian section of your grocery store. If you aren’t concerned about Weight Watchers Points, add some peanuts for extra crunch and deliciousness. This easy and delicious Thai salad makes the perfect Weight Watchers lunch recipe that can be prepared quickly and easily. The peanut lime dressing is divine and adds tremendous flavor to the dish. Soften the saifun bean threads but placing them in a large bowl and then pouring boiling water over them. Let sit in the water for 20 min. Then drain, and chop a bit so they are easy to divide. In a large bowl, toss together the baby greens, onions, cilantro, mint leaves, and cucumbers. In a small bowl, whisk together the peanut butter, lime juice, red pepper flakes, vinegar, sesame oil, soy sauce, garlic and brown sugar. Divide greens evenly onto 4 plates. Then top each plate with ¼ of the noodles, ¼ of the shrimp and ¼ of the dressing. Serve immediately. A big hit at my house. The salad was fresh and delicious, even though I had to substitute olive oil for the sesame and basil for mint; it was very good, will definitely make this again. The hubs said, don’t lose that recipe!